Will 2010 be Wilpattu’s swansong, with Sri Lanka going down in history as the country which deliberately allowed the destruction of one of its pristine beauty-spots not only of tremendous ecological value but also of archaeological importance? As the Ministry of Environment submitted a detailed report both to the Defence Ministry and the President’s Office, environmentalists were hopeful that President Mahinda Rajapaksa himself would intervene and stop the carnage of Wilpattu National Park. Top officials of the Department of Wildlife Conservation rushed to the area and studied the destruction, said Environmental Ministry Secretary M.A.R.D. Jayatillaka, explaining that the report instructed the immediate halting of all civilian traffic on two huge roads built within the National Park while allowing the jungle to reclaim what had been originally part of nature. 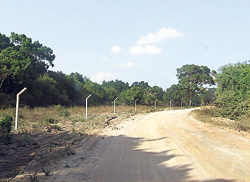 The Supreme Court on Thursday (April 1) granted leave to proceed with the fundamental rights application against the illegal construction of roads within the Wilpattu National Park. The Environmental Foundation Limited (EFL), the Wildlife and Nature Protection Society of Sri Lanka (WNPS), the Wilderness and Protected Areas Foundation and the Sri Lanka Nature Forum (SLNF) which jointly filed the application against the Director-General of Wildlife Conservation, the Minister of Environment and Natural Resources, the Commander of the Sri Lanka Navy, the Sri Lanka Tourism Authority, the Minister of Resettlement and Disaster Relief Services and the Director-General of Archaeology were granted leave to proceed by a Supreme Court bench comprising Justice Shirani Tilakawardane, Justice Saleem Marsoof and Justice S.I. Imam. The petitioners were represented by Ms. Ruana Rajepakse with Ms. Wardani Karunaratne and Ms. Upeksha Sapukotana while the Attorney General’s Department appeared for the Director-General of Wildlife Conservation. The petition will be taken up on April 26. Photographs in the possession of the Sunday Times reveal the extent of the destruction, with a coastal road and an interior road scarring and marring the face of Wilpattu and many roads acting as links between these two. “It is like a ladder, with roads criss-crossing all over,” said a perturbed environmentalist who was there just two weeks ago. The coastal road, hugging the spectacular Wilpattu beach has been cut through not only sand dunes and red-soil areas but also large shell deposits, he said. The interior road open to civilians is like a highway with vehicles with loudspeakers blasting messages, he said. “There is nobody to monitor them,” he stressed, adding that usually park visitors should enter through the gate off Nochchiyagama and must be accompanied by a tracker. The coastal road is also about 130 feet wide and has gone through archaeological sites such as Pomparippu. Massive craters have been formed due to erosion. Some craters are large enough for a jeep to fall in, he said, pointing out that if the road is allowed to be maintained, the animals would have no coastline for themselves and the nesting grounds of many birds would be destroyed. Another environmentalist who was in the area was visibly upset over the way the stark giants of the dry zone, the Weera and Palu trees, had been toppled. “It seemed the work of large bulldozers,” he said. For him another disturbing sight had been concrete pillars demarcating what seemed a large part of the north-west of the National Park. “What is happening there,” he asked, unable to find an answer. Meanwhile, a December 2006 report by the World Conservation Union (IUCN) titled, ‘Resource Inventory of Wilpattu National Park’ clearly indicates the significance of this nature hotspot. It states: “The Wilpattu National Park (WNP) is the oldest and largest national park in the country……..not only significant from an ecological standpoint but also extremely rich in archaeological terms housing a number of ruins and artefacts dating back to various periods of history. “The landscape of WNP primarily comprises dry zone high forest with lianas and thorny scrub interrupted by extensive open plains and sand dune rimmed water holes known as Villus. The WNP counts most representative natural habitats of the country in its confines with 13 major habitats under three major ecosystem classifications of forest & forest related ecosystems, wetland ecosystems and coastal and marine ecosystems. “…..The survey recorded 623 flowering plant species belonging to 123 plant families…….among them, 27 plants were endemic and 21 plants were recorded as threatened. WNP is a remarkable live gene bank for a number of economically and scientifically useful plants, e.g. 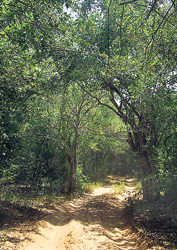 medicinal plants; crop wild relatives; dry zone timber species……additionally, ...various pristine habitats of the park provide valuable reference points for understanding and modelling the conservation of various species and habitats throughout Sri Lanka. “A high diversity of fauna was found due to the high habitat diversity within the WNP……..284 faunal species belonging to 101 families were recorded during the survey period among which there were 21 endemic and 30 nationally threatened species. 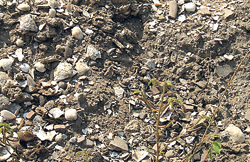 “……..A total of 68 archaeologically important sites were recorded, four of which were Miocene fossil sites. Twelve sites belonging to the prehistoric periods (Paleolithic and Mesolithic) were also surveyed. Several sites represent evidence of both prehistoric and historic periods. 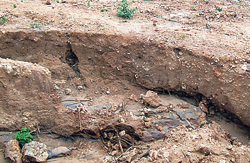 Forty-two (Black & Red ware pottery sites, Burials, settlements, and monasteries) were identified as a combination of proto-historic and historical sites... A major finding was the Weeransole ruins. Need anything more be said in defence of Wilpattu and the critical issue of its protection not only as part of nature but also our very own history..